These two easy-going paths begin and end in the village center of St. Peter. As the German name suggests, you are on sunny slope of the Villnöss valley and always have the Geisler peaks in front of you. On this tour you will learn about our holiday resort and its surroundings in about 2 hours, have only slight ascents and are rewarded with great panorama views. About an hour takes this route, where you climb the 480 m to the Ottohöhe – a popular viewpoint above St. Peter. In the village center you take the trail no. 5 and go to the Vikoler Jöchl, then along no. 30 to the Wolfsgrube and finally to the Ottohöhe (1,460 m) and the Jochkreuz. Back it goes over the Jochhöfe and the Moarhof. By the way, this place is named after a holiday guest, who liked to walk to Villnöss. With a difference in height of 420 m and a length of 9 km, this route is also suitable for families, but it is much more an alpine experience. 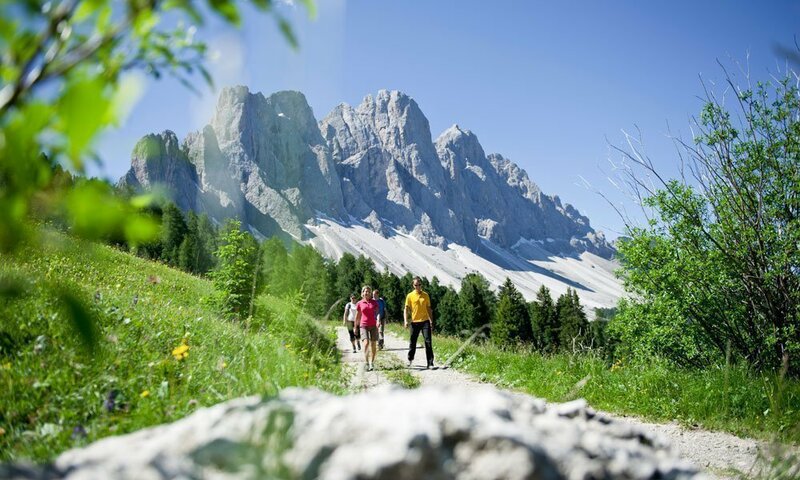 Here you go alpine hiking at the bottom of the Geisler Northern wall and crown your hiking holidays with a tour on one of the most spectacular paths through the Dolomites. For this, you park at the Zanser Alm at the end of the Vilnöss valley, follow route no. 6 to Tschantschenon and continue along the bridge on the Adolf Munkel route no. 35. There is the possibility to stop in each of the four huts along the route. This hike also offers you good opportunities for a break and enriches your round trip with interesting sights along the edge of the trail. These include the Mineral Museum in Teis, St. Valentin’s Church and St. Jacob’s Church with valuable art treasures and late medieval features. By the way, the museum offers the possibility to search for the Teiser spheres together with a specialist. Overall this tour is about 10 km long, on which you have to overcome about 500 m difference in height. It is well marked and begins or ends directly in Teis. 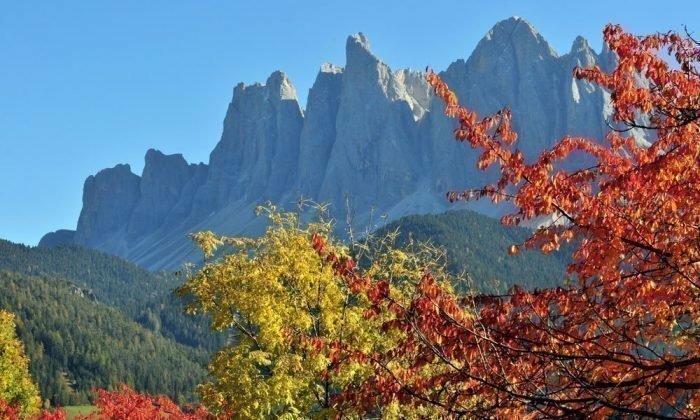 Visit the Natural Park Puez-Geisler! The round starts again at the Zanser Alm and leads you about 10 km along the southern slopes of the Aferer Geisler, overcoming 800 m difference in height. You cross the wonderful Villnösser pastures and pass the Zans game enclosure. This path is clearly marked as a “ Herrensteig“. Not everyone pulls it upwards: the Peitlerkofel, for example, can be wonderfully rounded on a nearly 13 km long tour over approximately 5 hours (600 hm). The route begins and ends at the Würzjoch. Alpine meadows, the Moibach Gorge and, of course, the bizarre rocks of the Peitlerkofel massif turn this round route into a highlight. 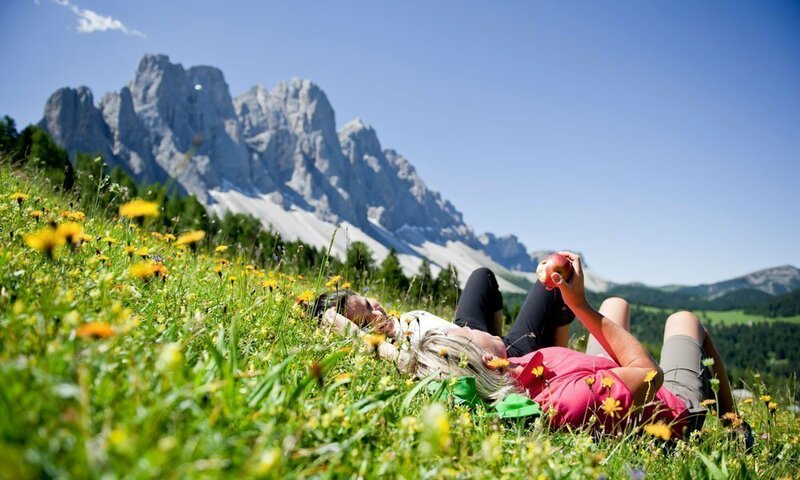 At the end of the valley of Villnöss (parking in Zans) starts the perfectly marked and easy-going nature trail Zans, where you can experience the beauty of our natural park. Alternatively you can try a change of perspective by taking a weekly bus to Gröden valley and from here you can take a ride across the Raschötz to Zanser Alm. We would be glad to provide you with more information about the hiking trails in Villnöss directly on-site. Südtirol Karte powered by – Outdoorportal und App für Südtirol.